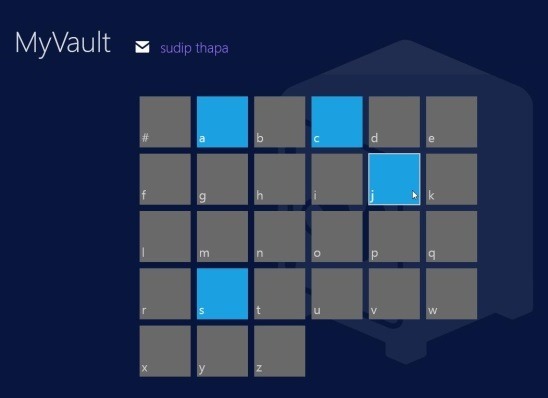 My Vault is a free Windows 8 password manager app that safely and securely stores your various logins, pins, and passwords. Along with these you can also save account name, service url, and a note that helps you to remember the entity with which the password is associated. All the data gets stored for free in one secure location: the MS AZURE CLOUD. The app lets you add and save as many password data as you want. This app is a of great usability to those people who have a large collection of usernames and passwords/pins. This free Windows 8 Password Manager App is present under the Productivity Category in Windows Store. This free Windows 8 password manager app is a good app and does what it is supposed to do. The app’s interface is extremely cleans and easy to use. Before you start adding and storing password data to the cloud, you need to sign-up with My Vault using one of the following: Facebook, Google, Yahoo, or Windows Live account. Once this is done, you can sign in and manage all your password data within My Vault’s cloud storage. You can also change the login account settings to another by choosing one of the above mentioned accounts. Like mentioned before,the app’s interface is pretty clean and contains easy to understand buttons and labels. Adding a password data is called cards in the app. All the cards gets categorized alphabetically. Plus the app also provides the schematic zoom with which you can quickly search cards in alphabetical order. You can also use the Search Charm within the app to search for a particular card. When you enter the password data, the app doesn’t display the exact password and keep it in hidden (dotted) form. However, you can anytime view these hidden characters by clicking at the Eye icon at the end of password text box in Card Edit Screen. As mentioned earlier all the data gets stored in Microsoft Azure Cloud, so nothing gets stored anywhere else until and unless you yourself want to. You can also export this data to your PC (for backup purpose) in xml format using the export button. The app takes proper care of your sensitive account information by encrypting the data using the AES 256 encryption algorithm. Manage all your password data at one place. Stores all the data in cloud. Encrypts account data using AES 256 encryption algorithm. Easily add, edit, save, and delete password data. Can snap the app to either left or right side of screen. My Vault is a really handy Windows 8 password manager app. Everything is kept clean and secure. It’s straightforward, fast, and useful. There’s no need to create a new account, you can use the app with your existing Yahoo, Windows live, Facebook ,or Google account. Above all, you’ll get everything for free. Even storing the password data in the cloud is free. So go ahead and give this app a try. Get My Vault app here.